In a large mixing bowl (I do this all in a Kitchen Aid, including kneading), dissolve yeast in warm water. Let stand for 5 minutes, then add sea salt. Add the flour and olive oil and mix until you can knead it with your hands (or dough hook). Once you can form a ball, put dough on a floured surface and knead for about 12 minutes (or do this in Kitchen Aid). Dough should be smooth now. Place it in a lightly oiled bowl and cover with plastic wrap. Leave in a warm place until risen to double, about an hour. Meanwhile, chop the rosemary into small pieces. After an hour, punch down the middle of the dough and work in the rosemary. Let rise another hour (or place, covered, in fridge overnight for a slow rise). Roll out for pizza. If you did a slow rise in fridge, let is stand until it is room temp before rolling. Rub pizza stone with some of the additional olive oil and cover with rolled-out dough. Drizzle more oil and the minced garlic on top of the dough. 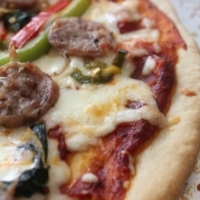 Cover with toppings (works well with or without sauce) and bake until dough is golden and toppings look done. You've won me over before I've even tried the recipe! KitchenAid, Freezeable & Pizza Stone!!!! Wow!! You rock!!! Thank you!!!!! Great simple post! I just got my Kitchen Aid this Christmas, an Artisan :) I love it so much, can't wait to start adding different attachments. Like kitchenscientist's recipes? Never miss an upload!